I have been asked to compose an original concert work for the prestigious 30th Annual NOW Music Festival held at Capital University in Columbus, OH. This music festival has always promoted cutting edge American composers. I’m honored to have been approached and asked to compose an original piece for the festival. 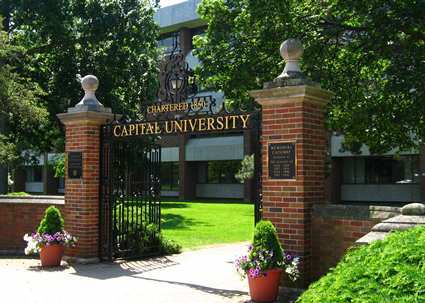 A long time ago, I attended the Conservatory at Capital University for the first two years of my undergraduate education. To this day I still fondly think of it as my Alma Mater, the place where I started the path towards my current profession. While I was there I studied with amazing musicians and educators, including Michael Cox, Stan Smith, and Dr. Rocky Reuter. As a composer I owe a tremendous debt of gratitude to Rocky; he taught me much of the musical foundation that I work from to this day. I never knew how thorough my musical training was until I went to other schools, and then worked professionally. It was a huge strength and asset to have studied at Capital. When you look back at early influences, and how they inform your current work, it’s interesting to see the path that led to my becoming a film composer. I didn’t set out to be a composer, rather a jazz saxophonist. But I was always writing, starting in high school, and then prolifically in college. Rocky opened musical doors to me, things I had never heard and ended up becoming lifelong influences to my composing: Steve Reich, Terry Riley, musique concrete, electronic music, synthesis, cell theory. Dr. Rocky Reuter eventually went on to become Dean of the Music Conservatory, and retired this year. In 2017 the conservatory will be hosting the 30th anniversary of the NOW Music Festival, in honor for Rocky and this amazing festival that he founded. I’m thrilled to be a part of this cutting edge American music festival and will be composing a new concert work for it. I’m just getting started; I know it will be a concert work in a minimalist style for a unique configuration. Right now I’m thinking a double string quartet with a woodwind consort. The title will be IN THE BLOOD.